Bustling with activity from morning to night, VivoCity serves as a shopping mall, event area and a linkway from the mainland to Sentosa. Yet, amidst all the never-ending human traffic, perched on the roof of the mall is an aesthetically appealing, peaceful SkyPark, complete with an amphitheatre, Olympic-pool-sized water feature and an abundance of open spaces – a perfect place to study. Wear long pants and bring a mat of sorts, to shield yourself from the prickly grass. Bring a clipboard or a hard surface for writing. By Bus: Buses 10, 30, 30e, 57, 61, 65, 80, 97, 97e, 100, 123, 123M, 131, 143, 145, 166, 855, NR1, NR6, RWS8. Alight at Harboufront Station. The SkyPark itself is wheelchair accessible. Wifi Access: Wireless@SG, but connection quality is spotty. Aircon: Not Available. The area is open-air, but the trees present can provide shade, and there is many a strong breeze. Marché and Paradise Dynasty are situated close by. Both are fairly pricey, but there are other cheaper food alternatives around the mall. See VivoCity’s directory for more information. Very low. Few people come near the area and fewer still choose to sit on the grass patch under the trees for long. There is little disturbance from members of the public. High. 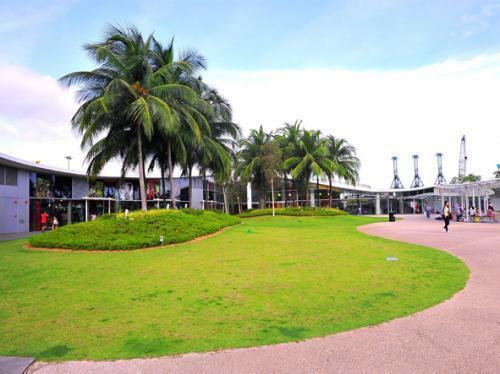 A fairly conducive environment for those who enjoy studying near Nature. 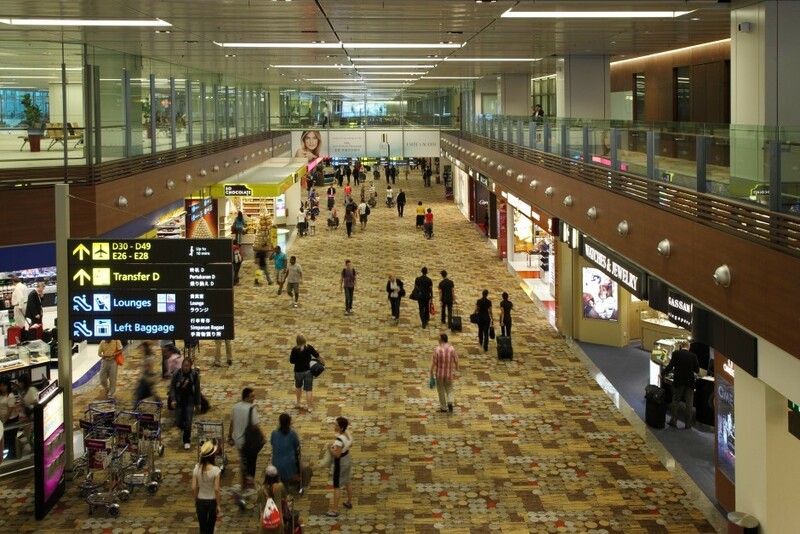 It’s never a dull moment at Changi Airport, what with several facilities open around the clock for people to satisfy their hunger pangs, catch a quick nap before boarding their connecting flight, or… even study. The numerous spacious open areas found around the airport are especially suitable for groups of students looking to combine bonding time and pre-paper mugging, and this is one of them. Tip: No tables are available here – it’s best not to bring laptops for work! By Bus: Buses 24, 27, 34, 36, 53, 858. Alight at the basement level of Changi Airport’s terminals. The open space is wheelchair accessible and easily found. Wifi Access: Wireless@SG and WiFi@Changi. Power Sockets: Not Available. The nearest ones are a floor down at the communal charging stations. Right beside Astons, which offers Western cuisine at affordable prices. Other 24-hour restaurants and cafes are situated within Changi Airport, including Paris Baguette, Toast Box and Swensen’s. See Changi Airport’s directory for a full list. Low. Few people are found sitting around the area due to the lack of seats. Huddle in a corner further away from Astons and you’re fine. High… as long as you can study productively without a proper chair and table, although you’ll have to lie on the floor or sit and lean against a wall. Recommended for those who can study anywhere and everywhere, and who aren’t using a laptop. Trains. You may think they’re noisy, shaky, crowded, and generally miserable. And you’d be right – well, if you’re standing up at least. Take a seat on the floor however, and everything changes when you suddenly find yourself a great surface to sit on! You’ll no longer lose your balance, and the slow rocking of the train as it moves actually becomes calming. The low rumblings and background chatter could in fact make for useful white noise and become conducive for studying. (If that’s not your thing though, feel free to bring along earphones.) Lastly, the crowds are now great scenery. Look up every few minutes, and hey, the view’s changed! You’ll never get bored again, and besides, who knows? You may look up to realise that a friend coincidentally just got on the same train. The end of a train, where you may be able to see the light at the end of the CT tunnel. The best spaces to occupy are the grey tunnel links between carriages. If those aren’t available, the corners beside the doors are a good bet too, as long as you can fit there without obstructing other passengers. Remember to bring a clipboard, or some sort of hard surface for writing. Pack light – You don’t want your whole stack of Economics notes carpeting the train floor after a fumble. Be considerate. Don’t take up more space than you need, and don’t trip anyone over. Ride fares range from 22¢ to a maximum of $1 for a train ride when using a student concession card. If needed, calculate train ride fares here. Find your nearest MRT to hop on a train, any train at all, and voila! Wifi Access: Not Available. You’re on your own here with mobile data – but on the bright side, there’s less room for internet distractions. None on the train, or else you may get fined for eating, but feel free to get off at a random stop to find some good food! Low to High, depending on the time of the day and peak hour crowds (it gets more crowded around 7 – 9 AM and 6 – 9 PM). First trains usually are at about 5.30am, and last trains usually depart around 11.30pm. Don’t go at timings too close though! Aunt Agony and Uncle Upset: Not Clique-ing with People? This is a very useless post. I tried studying on the MRT floor last week and guess what. For one thing, my papers were inadvertently stomped by oblivious passengers. After several stops (12-15), I was evacuated by an SMRT staff. Productivity was 1/10. However, if you really want to pull this off, please wear a headlamp as in the “grey tunnel links”, it is pretty dim. And avoid wearing any shirt bearing the school name, as you will probably end up on STOMP. OP said you can’t bring food. Of course you can, but consume it discreetly like I did (and please don’t bring snacks which can create a huge mess like Skittles or M&M, don’t be dumb). And don’t bother bringing a laptop because A) There is no power point anywhere and B) You’ll look like the main character from Watchdogs and police might be called (which is more likely if you wear a hood and a pair of chee ko pek sunglasses). Overall, a bad experience. I really hope this is an April’s Fools joke. Check out http://www.desknextdoor.com at block 416 amk ave 10. Tried once and i think that the place is super conducive and affordable. They also provide free wifi, charging point and water dispenser, food access is super convenient, alot of food centre nearby and is really cheap. Not only that, they even allow you to stop your hours when you go out for meal break. Why spend so much at cafe and fastfood restaurant when you can get cheap with full facilities equipped. @the changi airport post and productivity, the place just doesn’t work if you’re an aviation enthusiast though! Follow @rafflesaviation on instagram!